Wow! 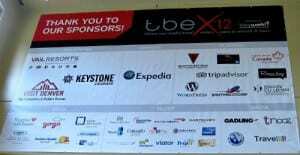 Who’s talking about TBEX? At TBEX, I met people who inspired and at the same time exhausted me–there’s so much to do! TBEX Wrap-up: Bloggers We Love! Blogging: fad or emerging market? Southwest Takes TBEX by Storm! Your Know You Were at TBEX If. . . . I know we’re missing a lot of blog posts about TBEX in Keystone, but if I waited to make sure that I had everyone on this list, the post would never get up. And that means you’d miss out on reading what your fellow travel bloggers have to say. So, if we’ve missed your blog post, or one that you know about, please leave the link in the comments or send us an email so we can add it. Let’s see just how high this list will go. Now, who is ready for Costa Brava? Here is my TBEX post. A Newbie’s Guide to TBEX! Here’s another viewpoint sharing in the love. This one was already on the list. The list has been updated with some new posts. Added a few more posts that were recently published. Yeee Hawww, great round up, looking forward to Spain….the wine, the cheese, the architecture…and TBEX. Updated the list to add a few more posts. If we’re missing yours, feel free to leave the link in the comments or email us. Here’s my take on a TBEX Newbie guide.